On Saturday, April 18, we will offer the League of American Bicyclists Road I course. Road I "Gives cyclists the confidence they need to ride safely and legally in traffic or on the trail. The course covers bicycle safety checks, fixing a flat, on-bike skills and crash avoidance techniques and includes a student manual. Recommended minimum age 16, ages 13-15 accepted with parent, this fast-paced, nine-hour course prepares cyclists for a full understanding of vehicular cycling." Description: Prepare for National Bike Month by taking a BikeEd class! This one day course will cover full Road I content including bicycle selection and maintenance, bicycle handling, and bicycle safety. The course combines classroom discussion and activities along with on-road practice of vehicular bicycling. Special signup instructions: Fee includes WalkBikeBerks membership for remainder of 2009. The following is a brief compilation of Safe Routes to School-related news stories from across the country. Web links to the following news stories are time sensitive, so some stories may not be accessible after the initial publication date or may require registration. Safe Routes Matters is a free, online publication of the National Center for Safe Routes to School. Please feel free to redistribute this email freely. No permission is needed to reprint from articles, but attribution is requested. Please join us this Saturday, February 28, 2009 at 9:00 a.m. for our annual meeting. We are celebrating the completion of our first year and setting our agenda for 2009. We are accepting new members right now. Have you picked up your copy of the Reading Eagle Newspaper today? If not, you will want to. The new stimulus package is causing quite a bit of excitement over transportation issues -- and we don't want to be forgotten. Make sure to contact the Reading Eagle, BARTA, and the Reading Area Transportation Study (our local MPO) to ask how your transportation needs as pedestrians and bicyclists will be met in the new projects. Borrowed from the Bicycle Coalition of Greater Philadelphia -- where there is always excellent, current bicycle and pedestrian information available. Thank you BCGP. WalkBikeBerks supports the completion of the Schuylkill River Trail from Berks County to Philadelphia. The Schuylkill River Trail is an extremely popular and heavily used recreational asset and commuter route. It also has the potential to be much more: a connector between a variety of Philadelphia neighborhoods and suburban neighbors, the region’s first green transportation corridor for multiple communities, a strong catalyst for economic development, and a critical access point to open space and commuting paths for under served neighborhoods. Bob Hospidor kindly hosted BCTV program WalkBikeBerks: Bicycling Rights and Responsibilities last night, February 23, 2009. Chief Garipoli of the Central Berks Regional Police Department was our special guest. You may also find the program here: http://bctv.org/WatchArchive.aspx?id=1068. Local communities around the country are working hard to figure out how we can get the most out of the limited financial resources we have -- to get the most bang for our buck. For more than a year now, WalkBikeBerks has been talking to groups across the county about Complete Streets. Our message has been consistent with the national Complete the Streets campaign: "The streets of our cities and towns ought to be for everyone, whether young or old, motorist or bicyclist, walker or wheelchair user, bus rider or shopkeeper. But too many of our streets are designed only for speeding cars, or worse, creeping traffic jams. They’re unsafe for people on foot or bike — and unpleasant for everybody. Now, in communities across the country, a movement is growing to complete the streets. States, cities and towns are asking their planners, engineers and designers to build road networks that welcome all citizens." It is important to note that Complete Streets provide many benefits including better access to mass transit. "Even in communities served by public transportation, incomplete streets may discourage residents from fully using the service. Many users are unable to get to transit stops in a safe and convenient manner. Nearly every transit trip begins as a walking trip – but the disconnect between transit and road planning means transit riders are often left to wait at bus stops marked by a lone post in the grass – no sidewalk, curb ramp or bench. Crossing the street to catch the bus may be hazardous." "A network of complete streets is more safe and appealing to residents and visitors, which is also good for retail and commercial development. Street design that is inclusive of all modes of transportation, where appropriate, not only improves conditions for existing businesses, but also is a proven method for revitalizing an area and attracting new development." The first round of public meetings were held in February 2009 to allow the public to see the planning documents, talk with planners, and voice their opinions of the study so far. Both meetings were well attended. If you missed the meetings, you can still participate in the planning process. All the documents are available on this site, along with a survey designed to gather input from the public. Please take some time to read over the information, and fill out the survey. Encouraging residents of Berks County to ditch their four wheels for two, the Berks County Commissioners officially proclaimed May 2009 as Bike Month in Berks County.Commissioner Kevin S. Barnhardt, on behalf of fellow commissioners Mark C. Scott and Christian Y. Leinbach, presented Berks County Court Judge Timothy J. Rowley with the official bike month proclamation. Rowley is a member of WalkBikeBerks, a non-profit organization established to encourage walking and bike riding in Berks County. Stressing the impact on the environment as well as fuel savings, Rowley talked about his own personal mission to bike to work. "I found this was no-brainer," Rowley told the commissioners. "I myself started riding my bike to the courthouse, as do three other judges, when the weather permits." Proclaiming May 15 as "Bike to Work Day," all Berks County employees will be encouraged to ride their bikes to work on that day. Berks County is one of the area's largest employers and Rowley is looking to these public-sector employees to take the initiative on what he feels is a safe and worthwhile endeavor. "The organization's mission is to promote bike riding in both the private as well as public sector and to raise awareness about safely walking and biking in Berks County," Rowley said. Michele Barrett, president of the organization, also provided the commissioners with information about the Bicycle Commuter Act, which was recently signed into law. The act provides commuters with up to $20 per month reimbursement from their employers for expenses related to a bicycle commute. Employers must be enrolled in the program in order to provide employees with reimbursement. For further information about the Bicycle Commuter Act, Berks County Bike Month or WalkBikeBerks, go to www.walkbikeberks.blogspot.com. An Elm Street Manager, Dean Rohrbach writes about the success of revitalizing his community -- and seems to explain that sidewalks are a key component of successful business districts. I invite other Berks County communities to build pedestrian task forces where residents, business leaders, and government officials work together to enhance their communities. I was happy to see Darrin Youker's article "West Reading hotel set to open in May" (Reading Eagle, Feb. 10) on the $5.6 million Candlewood Suites soon to be completed in West Reading. The Candlewood project demonstrated how residents, business leaders and government officials can work to remove blight, stabilize borderline areas and revitalize older neighborhoods. This investment adds to the attractive streetscape and needed infrastructure improvements to the business district completed by the West Reading Main Street economic development program. In addition the Berks County Redevelopment Authority invested $190,000 to improve Franklin Street last year.The Elm Street program community development program invested $161,136 in street improvements on Second Avenue in 2007 with another $225,000 planned for Yarnell and Grape streets in 2009. R.M. Palmer Co. also did its part by investing $40,000 to install new sidewalks on the first block of South Second Avenue in 2008. Candlewood Suites has been the latest part in a comprehensive revitalization strategy in West Reading that has produced livable residential neighborhoods, a vibrant regional shopping destination and cosmopolitan hub known for specialty shops and a wide variety of dining experiences. Urban cities in the USA and Europe have witnessed the social menace of having encouraged private vehicles by building more roads and flyovers and yet having bumper-to-bumper traffic - which implies that no matter how many roads you widen or increase, the problem of road congestion is incessant." ...and others who want better walking and bicycling access to mass transit in the 422 Corridor region. Planners are soliciting suggestions on ways to smooth out one of the region's toughest commutes. How will you recommend that the regional planners, engineers, and elected and appointed leaders address concerns along the 422 corridor? c - Build excellent pedestrian accommodations to/from all bus stops along Route 422 including signal protected crosswalks, pedestrian refuges, sidewalks and bus shelters. 4 - Complete the Schuylkill River Trail and integrate into the regional travel network, creating a seamless, well maintained, paved shared use path from Center City Philadelphia to Reading with good on street access to nearby destinations. (2.13.09) The U.S. House and Senate are expected to vote today on a $789 billion economic stimulus package that provides $27.5 billion to modernize roads and bridges, and includes a three percent set-aside of each state’s share of the $27.5 billion for the Transportation Enhancements program. At least half of funds must be obligated by states within 120 days, or the U.S. Secretary of Transportation can recall up to 50 percent of the un-obligated funds. Specific language for Federal Highway Administration infrastructure investment can be seen here. Also included is $8.4 billion to increase public transportation and improve transit facilities; $8 billion for investment in high-speed rail; and $1.5 billion for a discretionary surface transportation grant program to be awarded competitively by the Secretary of Transportation. The bill text and joint explanatory statement are now available here. The Federal Highway Administration (FHWA) and Federal Transit Administration have issued guidance to assist state and local agencies in preparing for implementation of the stimulus bill. The guidance includes Q&As and actions that can be taken to expedite economic recovery projects. · $53.6 billion in state fiscal stabilization funding: States must use 18.2 percent of their funding – or $9.7 billion – for public safety and government services. An eligible activity under this section is to provide funding to K-12 schools and institutions of higher education to make repairs, modernize and make renovations to meet green building standards. LEED’s green standards for schools include bicycle and pedestrian facilities and access to the school. · $3.1 billion is provided for the Energy Efficiency and Block Grant Program. This provides formula funding to cities, counties and states to undertake a range of energy efficiency activities. One eligible use of funding is for bicycle and pedestrian infrastructure. We have received our federal tax exempt approval as a 501(c)(3) non-profit public charity as of our incorporation date of Feb 26, 2008! Thanks to all the board members in helping with our filing and Susan Smith-Rife for her help as well! No need to widen lanes and build bigger highways. Instead, we can and should make improvements and repairs to our existing infrastructure -- while at the same time providing improved access to all road users. Our streets should accommodate even the most vulnerable -- pedestrians, cyclists, and disabled. Contact the County Commissioners and PennDOT and let them know that we need access to mass transit if we truly want to reduce traffic congestion. The best access would invite people to walk or bicycle safely to local bus stops and train stations. To reduce congestion, we need the option to leave our cars at home. Berks County officials say a plan to improve a stretch of Route 222 needs to move in its original direction. Because of money issues, plans to study a stretch of the busy highway changed last year. Transportation officials said $9 million allocated to the study would be better spent upgrading two intersections -- 222 at 662 and 222 at 73. PA Bikes and Walks, a new statewide bicycle and pedestrian advocacy group that WalkBikeBerks is a member of, has released an important action alert. 2) a law protecting cyclists from the dreaded "right hook," where a motorist passes a cyclist on the left and turns right into the bike's path. There is also a proposed amendment to add protection to all "vulnerable users," such as buggies and pedestrians walking in areas without a sidewalk, and not just limit it to cyclists, but this has yet to be been added. Although we think it's common sense for drivers to pass with a minimum of four feet and never make a right turn in front of a cyclist, these laws are intended to to protect us in the unfortunate event that it should happen. All too often the cyclist is blamed for any crash (just ask someone who's been in one), and often has little to no recourse or support from the law. These two scenarios are the top two most common motor vehicle-cyclist incidents. The League of American Bicyclists cites the lack of these laws as one of the primary reasons that Pennsylvania is ranked as the 38th most bike friendly (or 13th worst) State in the Union. We have an opportunity in this legislative session to pass a bill that will greatly improve bicycling safety in Pennsylvania, as well as improve the state's reputation. Last session, The Bicycle Access Council initiated HB2689 that included provisions to include these amendments. The prime sponsor, Rep. Ron Miller, is reintroducing this bill very soon. It is imperative to have the bill co-sponsored by as many of the 203 House members as possible. As of February 6th, there were only 6 co-sponsors. PLEASE CONTACT YOUR STATE REPRESENTATIVE. A sample letter follows but try to personalize the letter, especially if you have had an experience with a vehicle being driven too close to you or a “right hook." Go to bill information and select 2007-2008 session and enter HB2689. I support legislation that is being introduced by Rep. Ron Miller that will require motorists, when changing lanes is not possible, to give at least four feet of clearance when passing a bicyclist. It also requires a motorist who is making a right turn not to interfere with a bicyclist who is traveling straight. This is the same legislation as HB2689 from last session. Your co-sponsorship of Rep. Miller’s legislation will be greatly appreciated. It's official. 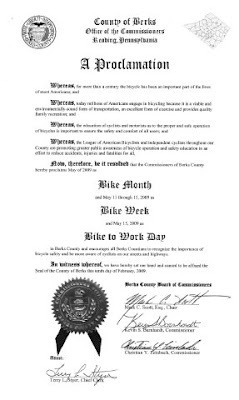 The County Commissioners have Proclaimed May 2009 Bike Month for all of Berks County. Telecast live, these weekly meetings are a first-hand look at how county government works. Watch the BCTV video archive to witness our request and the Commissioners proclamation. Calling All Bicyclists and Pedestrians! Please Take Action Today! Thanks to calls from bicyclist and pedestrian advocates like you, the Senate refused to hear an amendment that would have blocked any Economic Recovery Bill money from being spent on biking and walking infrastructure projects. Now we need EVERYONE’S HELP to make certain that there is strong support for Transportation Enhancements money for biking and walking in the final bill! The House and the Senate have each passed their own version of the Economic Recovery Bill, aimed at creating jobs and stimulating the economy. Both bills include billions for transportation infrastructure, but only the House bill includes funding for bicycle and pedestrian projects in the Transportation Enhancements program. The House bill includes approximately $1.35 billion for Transportation Enhancements of which 50-60% is traditionally spent on bicycle and pedestrian projects. The Senate bill does not explicitly include Transportation Enhancements, so it’s unclear whether this funding will be in the final bill. 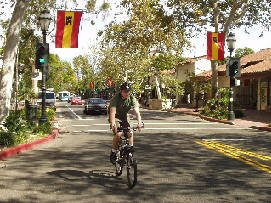 · Bicycle and pedestrian projects create jobs at the same or better rate than highway projects. · These smaller projects can move quickly to hire local businesses and help local economies. · Providing safe and convenient bicycle and pedestrian access gives families healthier and cheaper transportation options. · Improving sidewalks and bike lanes can make a downtown a destination further helping the local economy. · Better biking and walking options also help ensure greater energy independence, less pollution, and a healthier United States! Please share this email alert with all bicyclists and pedestrians you can, and encourage them to join you in supporting biking and walking today! Thank you – together we will make a big difference! We are working hard to make bicycling and walking better for you. We'll try to figure out how to work with their bike donation program. Tuesday AM -- Attend County Commissioners meeting. Board members and members at large will request that the commissioners support Bike to Work Month. Tuesday PM -- Finance Committee meets to plan membership renewals. Wednesday AM -- Host 10,000 Friends' Transportation For Pennsylvania (T4PA) meeting at the Goggle Works in Reading. I found a wonderful new blog that I think is just fabulous -- Blog to Lose! The most fascinating piece of the blog are member comments -- filled with people who are walking, biking, running, and moving in their own neighborhoods as part of their weight loss plan. There is one group that is of real interest to me, 12 Million Steps! The writer is walking 12 million steps in 3 years to reach his weight loss goal. Why? Because he loves to walk! Can't argue with that! Good luck Jay Maynard. I think I'll pick up a pedometer and join you! You need to be a member of 12 Million Steps to add comments! Okay, I joined... but I set my goal at 1,000,000 steps. Thinking of anything more than that makes me want to die. It's fate! My husband just brought home a book about places to walk in our city and the metro area... I think he is trying to tell me something. Does anyone else out there like to walk as much as I do? So far I am a group of one. The best way to secure the most jobs -- according to many sources, including the chart below -- is to increase infrastructure spending. If we intend to get Americans back to work and to create sustainable improvements in transportation, education, the economy, and the environment -- we need to spend more money on green, sustainable infrastructure. Take a look, then call your elected officials today! 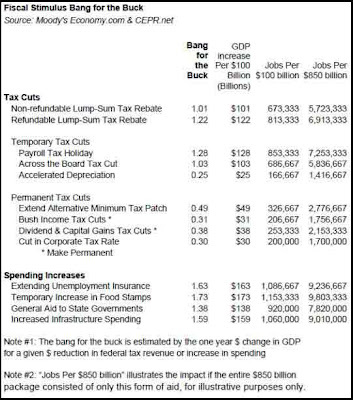 Improving our roads and bridges -- Main Street loosing to Wall Street? "Every five years Congress considers Highway Authorization legislation which determines federal highway funding for states. As a member of the Transportation and Infrastructure Committee which has primary jurisdiction, Congressman Gerlach helped to secure $8.233 billion for the Commonwealth of Pennsylvania from 2005 through 2009 (roughly $1.65 billion per year). In addition to improving federal highways and bridges throughout the commonwealth, this funding also provides money for greenways, pedestrian trails and bike paths in our communities." The Amendment has been offered but not introduced. We do not have a schedule for when this will be introduced and voted on, but we need to alert all Senators to urge them to vote against such amendments and ensure that funding for pedestrian and bicycle infrastructure remain eligible under the transportation funds provided in the stimulus package. Bicycle and pedestrian projects create jobs at the same or better rate than highway projects. These smaller projects can move quickly to hire local businesses and help local economies. Providing safe and convenient bicycle and pedestrian access gives families new cheaper transportation options. Improving sidewalks and bike lanes can make a downtown a destination further helping the local economy. and 'Kutztown board reconfigures elementary schools' by Park. Aesthetics:Pleasant vistas, absence of noise, open fields, wooded areas? Negley writes, "Without the staggered start times, the district would have to spend $1 million for new buses and drivers, Mussoline said." This does not have to be the case. Districts can cut transportation costs by keeping schools in neighborhoods where children live and by participating in the Safe Routes to School program. The International Walk to School event lists 225 schools in PA which supported safe walking and bicycling. School districts in Berks County, such as Fleetwood and Antietam, prioritize children's health, the environment, and safety by promoting walking and bicycling through education, encouragement, enforcement, engineering and evaluation. Children who attend neighborhood schools can enjoy walking and bicycling to school all year long with Safe Routes to School programs. Federal legislation, PennDOT, and PANA recognize the value of walking and bicycling and provide funding for communities to establish SRTS programs. I hope school boards seek input from the public and promote wellness and community development. When schools reorganize by grade level, children in the district are likely to be bused every year. Building and maintaining neighborhood schools allows children to walk or bicycle half of the years they attend public schools. The health and financial costs alone should be incentive enough for districts to protect and build neighborhood schools. 225 Schools Walked in 2008 -- Surely We Can Do Better! Students from 225 Pennsylvania schools, including several dozen in the Philadelphia area, will walk to school today instead of taking buses as part of a campaign to fight childhood obesity through promoting the health benefits of children regularly walking and biking to school. The Walk to School Day is sponsored by Pennsylvania Advocates for Nutrition and Activity (PANA), in partnership with PennDOT, which is providing the funding for PANA's Safe Routes to School initiative. The program seeks to educate schools and communities about safe walking and biking practices by providing mini-grants and technical assistance to those communities interested in implementing walking plans. According to PANA, national statistics shows that less than 15 percent of students between the ages of 5 and 15 now walk to or from school, compared to 48 percent of children walking or cycling to school in 1969. More information about the program and the participating schools is at the website of the Safe Routes to School Academy: www.srtsacademy.org. Contact staff writer Dan Hardy at 610-627-2649 or dhardy@phillynews.com. With ridership at record highs, transit agencies across the country are facing unprecedented fiscal crises in this economic downturn, with many considering layoffs, service cuts and fare hikes that are hitting at the worst possible time. ... job cuts, service reductions and fare hikes, but will receive no assistance under the current recovery proposals before Congress to prevent these painful cuts. No Blank Checks For Highways! The Senate is poised to raid high-speed rail to throw billions more to the highway lobby! There's time to stop it...but it's running out. Tell your senators: No road-building blank checks! I know we've been asking a lot of you, but I need your urgent help again today. Senator Kit Bond has proposed two amendments that would strip all funding in the stimulus from high-speed rail and move it into highway construction! Meanwhile, Senator Jim Inhofe has an amendment of his own that would add $50 billion to a slush fund for road construction - a virtual blank check for the highway lobby! Write your senators TODAY and urge them to vote against raiding transit and rail funding for a highways-only slush fund! Imagine it: tens of billions with no strings attached - no language for accountability, no prioritization for repair, and no promise of clean energy solutions for the 21st Century. Sen. Bond's amendments in particular would raid funding for the most innovative projects, leaving exciting new transit solutions like California's high-speed rail line on the cutting-room floor. Last week, we made a huge impact on the House version of the economic recovery package. After receiving your letters and phone calls, members of Congress added $3 billion in transit investment to the bill. Now we need to keep pushing on the other side of the Capitol. If we don't, the transit money could be overwhelmed by wasteful spending that serves the special interests rather than the public interest. We need your help NOW. The Senate is deliberating on this TODAY! Tell your senators: "No blank checks for highway construction!" Thank you for your support at this critical time. In the heart of Berks County's Pennsylvania Dutch Country where foods like shoo fly pie, 'sticky buns' and hearty meats and pot pies are dinner-time staples, the legacy of heavy eating habits poses a challenge to this generation. Unlike their ancestors who burned off those high calorie meals with long hours in the field, tending to the county's farms, today's kids spend much of their time in front of computers and TVs, and simply aren't as active as their grandparents. But Fleetwood Area School District has launched a campaign to change that. All five buildings in the district have enrolled for a second year as Keystone Healthy Zone Schools, and all five have embarked on major initiatives to get their kids up and moving with walking programs, partnerships with a local gym, a walk-to-school day, and complementary nutrition education programs. At the center of the efforts are the district's school health councils. "I had wanted to put one together for several years now, but never had the time allotted to do it," says Jan Warischalk, certified school nurse at Andrew Maier Elementary and the district's other elementary buildings, who has been leading Fleetwood's Keystone Healthy Zone initiatives. Jan and the district nurses had been tracking students body mass indexes for several years and saw that they were high. Andrew Maier building principal Anthony Bonanni suggested a walking program would be a good way to get the kids active in a structured, safe manner during recess. Fleetwood Elementary students rallied with parents, teachers and school administrators for Walk to School DayBonanni also challenged the kids to keep track of their steps --- and to walk the equivalent of the mileage (3,000 miles) to Bandon, Oregon, a sort of 'sister city' to the school's hometown of Blandon. The students met the challenge by Christmas, so he then challenged them to "walk to" Brandon, Florida by the end of the school year. The school gave students cards to log their mileage, and rewards them for miles walked. The rewards, which are quite significant - last year Jan gave out 10 bicycles - are being purchased with grant money from the Department of Community and Economic Development that Pennsylvania Senator Michael O'Pake helped the school obtain. For every 20 miles walked, students got to put one ticket in a drawing for a bike. For every five miles above that, they got to add an additional ticket. Students collectively logged 7,000 miles in the 2004-05 school year. A parent in the school district who works as an architect, John Watkins, is also donating much of his time at a discounted rate to help build a walking trail around the perimeter of the high school's campus. Building a Better Boyertown was in the spotlight at the 24th Annual Boyertown Area Progress Dinner on Jan. 21 in recognition of its accomplishments during 2008.TriCounty Area Chamber President P. Timothy Phelps and Berks County Commissioners Christian Y. Leinbach and Kevin S. Barnhardt presented the James K. Quality of Life Award to BBB President Charles Haddad and Main Street Manager Heather Oxenford at the event held at LaMassaria at Bella Vista Golf Course in New Hanover Township. "Good things do not happen by themselves; it takes good people," Haddad said during the presentation. "We are fortunate to have good people in Boyertown to make things happen." BBB, a nonprofit organization, started in 2002, as the result of Mayor Marianne Deery's vision. Business and property owners made approximately 27 faςade improvements using $75,000 in grant funds and about $100,000 in private investments. Improvements included the addition of new ramps, doors, and windows; painting; minor repairs; and planters. BBB revived the entrances of the Borough's inner core parking lot by adding benches, planters and walkways. "The Rhudes (Kevin and Dawn) recently purchased the State Theatre," Haddad told the 200 people in attendance. "This will become a main attraction to Boyertown with the continuation of movies and the addition of live performances by local theatre groups." Future plans include a $3 million streetscape project to improve the seven-block area surrounding Boyer's Corner. The streetscape will include the addition of brick walkways, plantings and Victorian-style lighting. BBB secured grant funds for these improvements. BBB also assisted the borough in purchasing the two-acre railroad parcel near the existing railroad tracks. BBB secured grant money to renovate the area when it knows the fate of the rail line. A New Bike Friendly Shopping Center in PA? A new shopping center is planned for Denver, PA -- and the township planning commission is asking for some changes to the design plan. Among the requests: bicycle accommodations and recreation space. "Placing bicycle racks around the parking lot to accommodate ...families who rely on bicycles for transportation. Grant T. Smith, senior project manager with Stackhouse Bensinger Inc., Sinking Spring, said the request would be considered." Plan to call a Senator Today: Print the brochure provided here, or use one or more of the benefits fact sheets to polish up on your 'expertise' before calling. Click on the links below to see our fact sheets highlighting the benefits of complete streets. We encourage you to print and circulate these! Note: "Print" versions are high resolution and "Screen" versions are low resolution. "Text" files are in MS Word format. All content borrowed from http://www.completestreets.org/index.html. 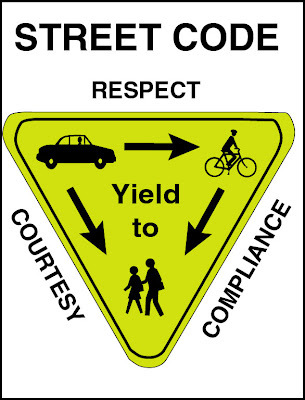 Philadelphia Bicycle News: What is Street Code?